We are a small, family-run, organic winery making natural wines, unfiltered and pure in the old world traditions. 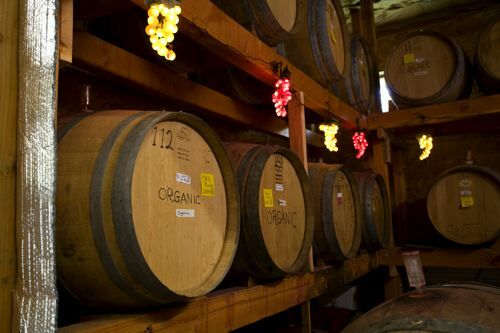 We have been making organic wines in the Northwest Columbia River Gorge since 1993. We farm our vineyard using a method we’ve developed and named eco-dynamic agriculture. By reintroducing the native wildflowers and bunch grasses between the rows and around the periphery, we strive to increase biodiversity as much as possible. 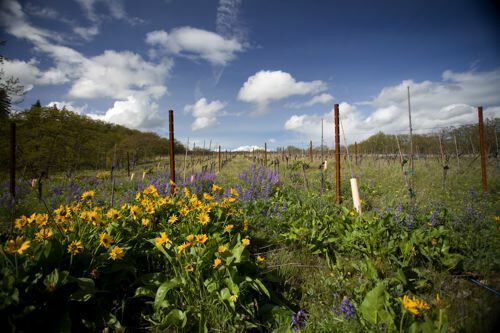 As a result, our vineyard has become a continuation of the surrounding environment, as opposed to an oasis for non-native and sometimes harmful pests. We think of it as a form of agricultural habitat restoration. In addition, we have a non-profit organization called the “Center for Eco-dynamic Agriculture,” to promote and share this type of farming with the larger agricultural community. We named our vineyard Meadowlark Vineyard because the promotion of native bunch grasses provides habitat for the beautiful Western Meadowlark, a ground-nesting bird in our region. By reintroducing indigenous ground cover into the vineyard, we’ve brought back the required habitat for the Western Meadowlarks, who in turn reward us by eating pests and providing harmonious song while we work among the vines. We produce natural wines made in the old world tradition. By this we mean nothing is added to our wines as they are manually stomped and allowed to ferment in oak barrels, all the way to dryness. Our fermentation differs from most other winemaking processes in that we do not use any sulfites, clarifying agents, filters, or even any added yeasts. The wines are aged in American Oak, typically two years for whites and three to four years for reds, depending on the readiness we deem through a barrel tasting. When ready, we bottle the wines and label each of them by hand. Because we do not add sulfites, vinification tends to be a longer process and our wines reach the market as older vintages. It takes a lot of patience to wait for Mother Nature, but we think the result is worth it. Additionally, in the Columbia River Gorge, the grapes tend to have high acidity, which allows for the wine to age and keep for long periods of time. Our philosophy is that nature provides all we need to make a delicious wine, true to where we live. Thus, our wines are vegan (without egg white or fish bladder clarifiers) and made in a way that reflects the true character of the Columbia Gorge Appellation and all its intricacies. Nothing added, nothing taken out ~ Nothing but the grapes. Robin Dobson has been a grape enthusiast from an early age. Primarily raised in Geneva, Switzerland (where his father’s job with the World Health Organization took the family), young Robin was imprinted early with European grape culture. Memories of biking down to the local winemaking cooperative and drinking their sweet grape juice had a lasting effect on Robin’s path. After moving home to Berkeley, CA, he obtained his Bachelors in Biochemistry at UC Davis and went on to complete his PhD in Plant Pathology at Washington State. From there he traveled to Nigeria for more post-doctoral research in agriculture. Upon his return to the states, he settled in the Columbia Gorge and has worked as an ecologist for the US Forest Service since 1985. One of Robin’s greatest achievements is helping to establish the Columbia River Gorge National Scenic Area, where he still works today. Robin Dobson has beautifully combined his passion for nature and wine in his endeavors with Klickitat Canyon & Columbia Gorge Winery. 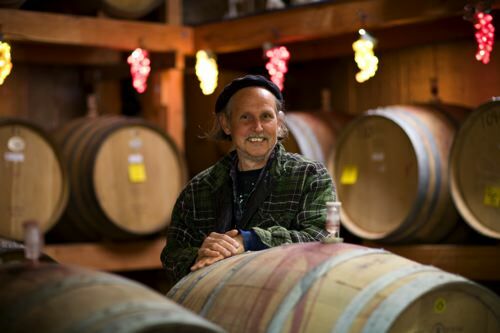 As an ecologist for the US Forest Service and as a grower/winemaker of Klickitat Canyon & Columbia Gorge Wines, Robin demonstrates his unwavering dedication to conservation and sustainable agriculture. Sustainability is a huge part of how we operate. To see all the practices we employ visit our sustainability page.